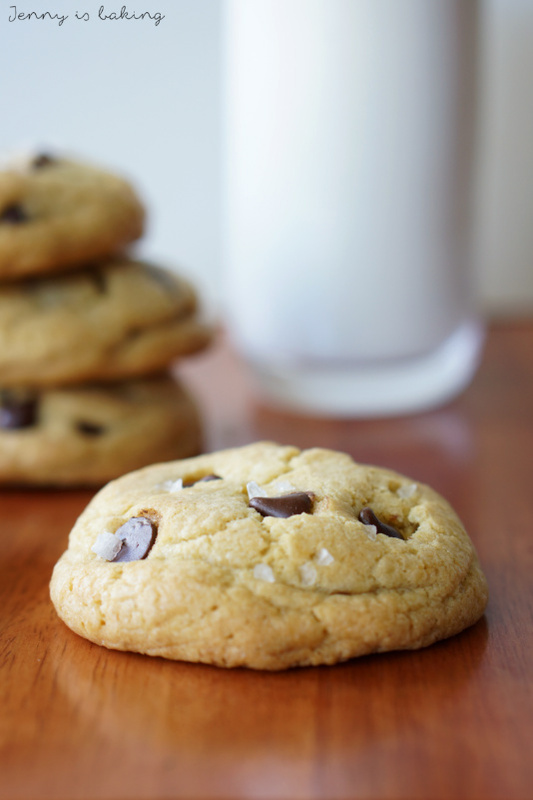 Friends, it is time for a special chocolate chip cookie! One with brown butter and sea salt, because I am into that. Maybe I am lame, but I don’t care, I am in love with chocolate chip cookies. In case you didn’t know, I looked high and low before finally settling on this recipe for the traditional chocolate chip cookie. Believe me, I tried more than 20 recipes, I asked everybody and I made many, many batches. My husband got desperate after eating all those cookies and asked me to stop. But I couldn’t, I had to find the perfect recipe. Which I finally found, thank God. 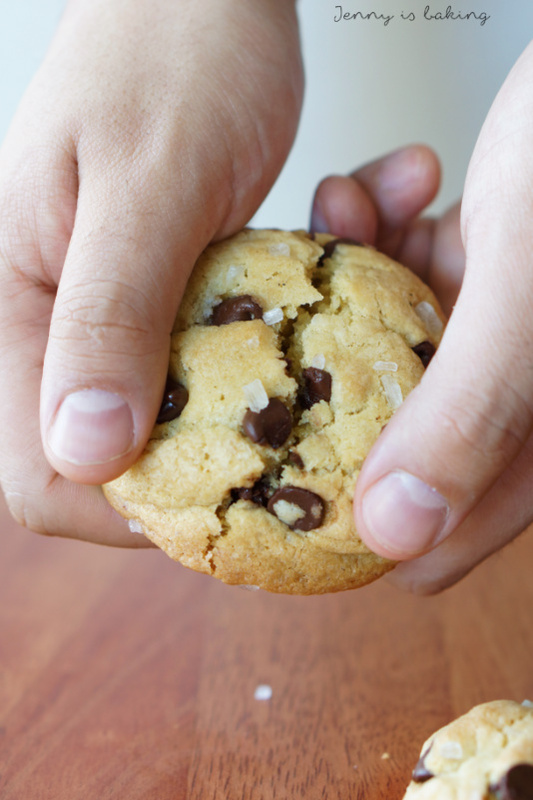 The recipe I am going to present today is a slight twist to my beloved traditional chocolate chip cookie. I took that recipe and made it – better. Yes, a bold statement, but I believe that this cookie is even better. Because it has brown butter, which makes it taste very much like caramel, because it has sea salt, which is the perfect contrast for its sweetness and because you still only need one bowl and pot and not even a mixer. How can you not think this is even better? Yes, I dare ask. I really love this cookie. Anyway, but enough about it being perfect, just grab all ingredients and let’s get started! Melt 120 grams of butter on the stovetop on medium heat. Continue browning until it starts smelling nutty and changes color, this takes a few minutes. First it will become bubbly, once it quiets down, it starts changing color quickly. Once it has amber color, add additional 60 grams of butter and set aside for the butter to melt. Measure sugars into a large bowl and stir in the melted butter. Add eggs and vanilla extract, mix well. Add flour, cornstarch, and baking soda and mix until combined. Fold in chocolate chips. Save a few chocolate chips for decoration. Chill for at least half an hour or up to three days in the fridge. If kept for a long time in the fridge, let come to room temperature first. Roll balls into the size of a golf ball and bake between 8-9 cookies per baking sheet for about 12-14 minutes. Edges should be golden, but center still soft. 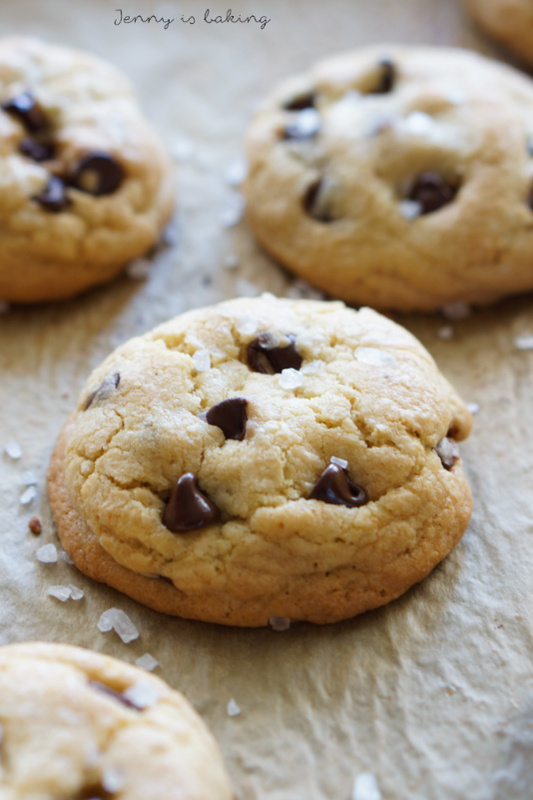 Press in additional chocolate chips and sprinkle with sea salt. Transfer to cooling rack after a few minutes. 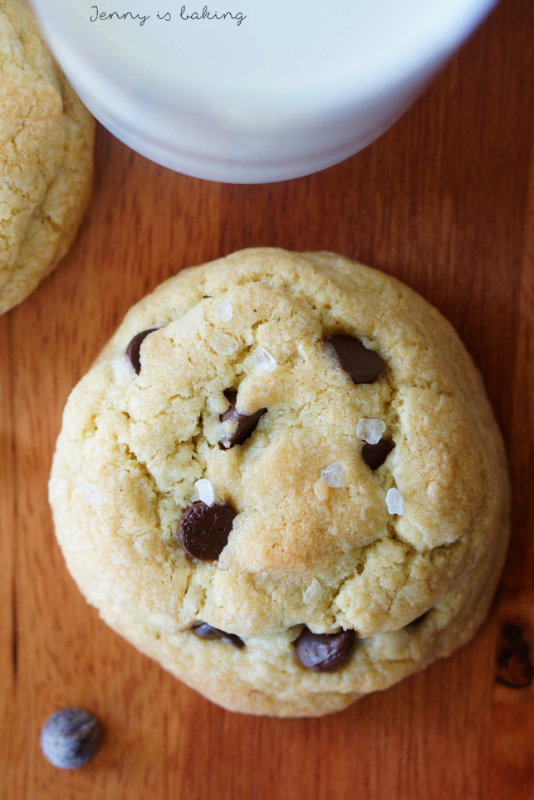 Chilling is mandatory for these cookies. At least one hour helps for the cookies not to spread as much. If you are desperate, chill for half an hour. You can freeze this cookie at two stages. Either you prepare the dough, roll the cookies individually and then freeze the cookie balls. Or you bake the cookies and freeze the cookies already baked. If you do freeze while still a dough, you have to add a few minutes to the baking time. I don't recommend using margarine. The buttery taste makes them super delicious. Yes, you can go crazy. I have added salted peanuts, sea salt, M&Ms or chopped up the leftover Christmas or Easter chocolate to add to these cookies and all additions taste great. Feel free to adapt.